Nostalgia is a powerful force in life. As I get older (approaching forty in a few years), I look back on events from my childhood and teenage years with much fondness. I have tried to reconnect with some of my favorite things from the past, including Transformers, vintage video games, and, of course, Dungeons & Dragons. Since my DMing time is in a lull right now, I have spent some time reading up on the history of D&D in general, and how it relates to my life in particular. This post will be the first in a series I am calling “D&Development”. I plan to go back in time and take a look at some of my most vivid memories in D&D, the type of things that shaped my experiences as both a player and a DM. Modules, settings, even novels and other tie-in products might be discussed, so long as they had an impact on my life. I realize this is a rather personal type of writing that many viewers may not enjoy, but perhaps some older fans like me will find them worthwhile. Imagine with me, if you will, a school playground in 1984. Dust from the kickball field blows by in the wind, swingsets creak and groan, and children laugh and yell as they enjoy a few precious moments of play. I am 10 years old, and sitting at the teeter-totters with two friends of mine. These boys came over from another school to mine once a week for Pioneers, a gifted classroom we were all students in. As you might expect, we were all a bit nerdy, but this was back in the day when reading books and using computers wasn’t cool like it is now. One of these friends, Jason, was telling a fascinating story set in an eerie castle, the home of a noble vampire. The best part of the tale was the fact that my other friend Marty and I were characters in the story, and Jason wove our speech and actions into the narrative. I had never experienced anything like it. Jason told me to be something called an anti-paladin, a creature I’d never heard of before. Marty was an assassin, a concept I was at least familiar with. The details are sketchy, but I remember being chased across parapets and risking my life for magic potions and bags of gold, and fighting off Marty’s assassin as well as the vampire himself in order to survive. There were no dice, character sheets, or rulebooks; in fact, Jason was going from his memory of the adventure itself, which he’d left at home. I was enthralled by the story, and thrilled that I was an active participant in what happened. It was like a Choose Your Own Adventure book we were all writing together at the same time. Jason told us if we wanted to, we could join his “DD Club”, which was for fans of Dungeons & Dragons and Duran Duran. I was as big a fan of “Hungry Like the Wolf” as anyone else with a radio, so I accepted his offer. And so began a lifelong love of D&D in general, and Ravenloft in particular. By 1990, I was sixteen, and playing AD&D 2nd Edition regularly with many of my friends. When the Ravenloft boxed set came out, I picked it up immediately. 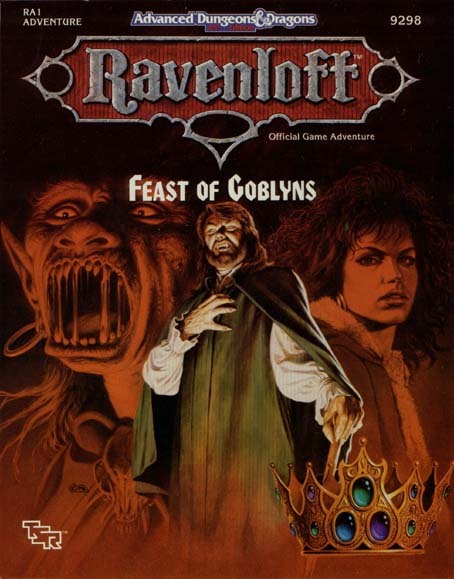 I had never played the original module again, oddly, but I had read the Ravenloft-themed Adventure Gamebook a few years prior. I devoured all the information in the black box voraciously. Perhaps my love for old monster movies was part of it; seeing Dracula and Frankenstein analogues as well as werewolves and mummies was fantastic, and seemed a great fit for a role-playing game. I ran Feast of Goblyns and Touch of Death as well as my own homebrew adventures with my playgroup. Ravenloft’s resurgence went beyond just the realm of modules and sourcebooks, though. The Dragonlance and Forgotten Realms novels had me hooked on D&D-related fiction, and when the Ravenloft tie-ins showed up, I added them to my bookshelf. I particularly enjoyed Knight of the Black Rose, which transported the memorable Death Knight Lord Soth from Krynn to the domain of dread. When I got my first “official” job at a Waldenbooks in 1992, I began to purchase even more Ravenloft stuff, all at a nice 10% discount. I suspect that I have owned more Ravenloft material than any other D&D setting, with the possible exception of Dragonlance, due to the large number of novels it spawned. I was a big PC gamer during this time in my life, and of course played all the D&D games I could find. When the first Ravenloft game was released, I skipped my classes (and an unhealthy amount of sleep) in order to play it. I remember it had superb graphics for the time, and I especially liked the paper doll style inventory screen. The sequel, Stone Prophet, was just as good, featuring a mummy and set in a desert, similar to the module Touch of Death. 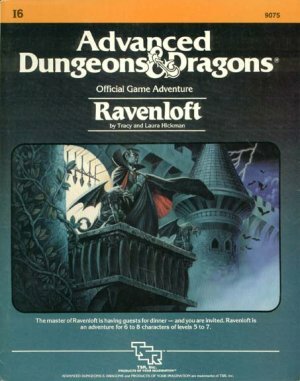 The storytelling and sense of horror that made Ravenloft so unique were not as strong in video game form, but that didn’t stop me from playing each of these games multiple times. Even in the past few months of beginning to DM again, I can see that my time spent in Ravenloft has had a big influence on me. It was my purchase of the new Ravenloft board game that got me back into D&D again after many years. I focused on the skull plotline from the”Twisted Halls” Red Box adventure as a major story arc in my campaign. My heavily adapted version of “Dungeon of the Ghost Tower” used many elements that would have been quite at home in a dark setting like Barovia. I’m a bit saddened that the Ravenloft 4E setting appears to have been cancelled, but perhaps I will try the Shadowfell boxed set out, and see if it scratches the same itch. In any event, I learned much about storytelling and the power of suspense and horror from Ravenloft, and this knowledge has been invaluable to me as a DM. Thanks for bringing back the memories. That was a fun read. I’m about 4 years older but I can easily recall similar experiences (including the Duran Duran reference). Seems like a lot of us “old-timers” have been thawing ourselves out lately. I’ve picked D&D late in the 90’s, catch the Advanced D&D, and played generic adventures, but I remember the advertising inside the books about the other campaign settings. I Loved Ravenloft and Dark Sun since I saw them there. D&D was a closed circle in my country by the time, so getting the books was almost impossible. 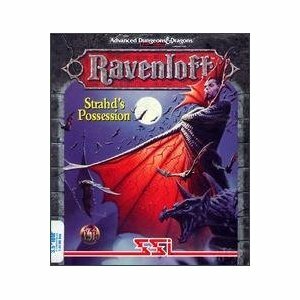 I got the chance with the Ravenloft 3.0 Edition made by Sword and Sorcery and embraced. The Maps, the Darklords, the mist and the Dark Powers. I really hope to see a Campaign Setting of Ravenloft in 4th. I bought the Heroes of Shadow and the Shadowfell and think they are more like complements for a future Ravenloft CS.